News from LMCU: Quick and Easy Gift Ideas! Quick and Easy Gift Ideas! Stumped on what to give the person that has everything? Consider one of our two Visa Gift Card options or a ticket package to the Night with the Griffins! Visa Gift Card. This one-time loadable card can be loaded with any amount up to $500 and used like a credit card until no balance remains. It is welcomed at millions of locations worldwide where Visa cards are accepted. Visa Reloadable Cards. Our reloadable Visa card can be reloaded from anywhere-by phone or online, 24 hours a day, with your credit or debit card; or by simply stopping by your local LMCU branch. Both cards eliminate the risk of carrying cash and feature zero liability from fraudulent use by a lost or stolen credit card. Do you have a hockey fan on your list? Tickets to the 9th annual LMCU Night with the Griffins make a great gift! The game is Saturday, February 4 at 7 PM at Van Andel Arena and matches up the Griffins against the Hamilton Bulldogs. Tickets are $11 for Upper Bowl and $15 for Lower Bowl seats. 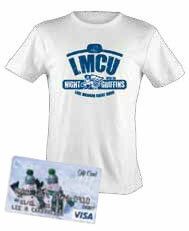 Each ticket includes your game ticket, a FREE $3 food voucher and a FREE LMCU/Griffins t-shirt! Tickets are on sale now and available at all branches. For more information, visit LMCU.org or stop by any of our 32 branches. © 2018 Lake Michigan Credit Union. Powered by Blogger.